By bridging the gap between developers, designers, and animators, QuartzCode is a revolutionary new iOS app. 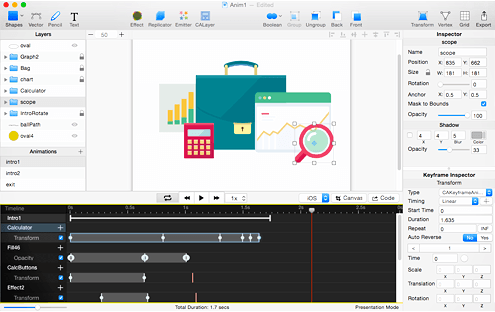 QuartzCode is a fast, lightweight, and powerful animation tool that enables users to create animations for iOS/OSX without doing any coding. Turn vector drawing and animation to Objective C and Swift code easily! Creating animation for your iOS/OSX project is now easier than ever. Change any property and see animation changes in real time. Users can choose from six unique layers and more than 25 animatable properties to create stunning animations. Users can even create multiple animation states in a single project. Iterate any animation within seconds while seeing the code side by side. The barrier for creating animation in XCode is dramatically reduced with QuartzCode! QuartzCode comes with a variety of tools to make the lives of developers easier. 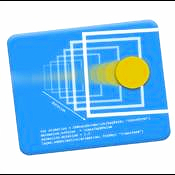 Some of these tools include vector drawing, alignment, and the layer inspector. Each layer in QuartzCode has a different purpose and its’ own unique animatable properties. Combine multiple layer types, such as shape, mask, text, and replicator, to create interesting animations. QuartzCode is available in the App Store now. Comment and let me know what you think!